Can you mention any specific eccentricities about the drawings? 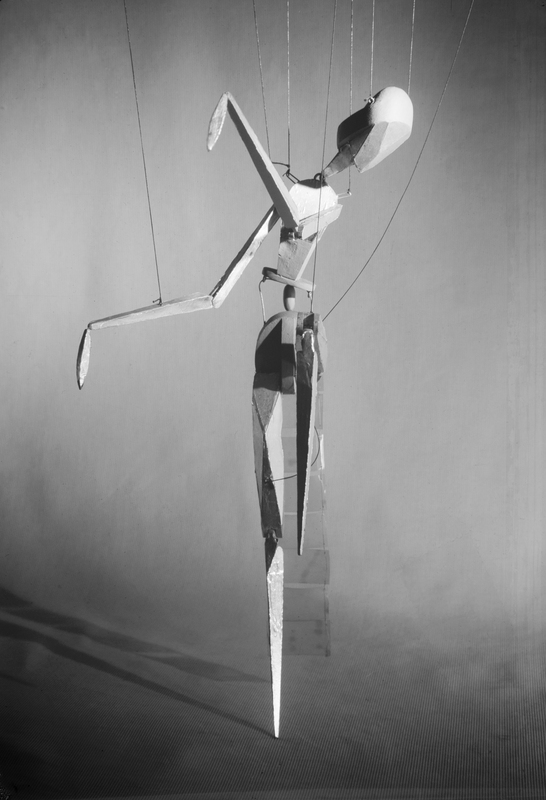 These days there is a tendency to shy away from eccentricities as if they were flaws and lean towards a robotic look. I have had many encounters with Dwiggins‘s Electra both inside the San Francisco Chronicle and out. In the past I was furnished with scant research (specimens in type books, a couple of small pamphlets letterpress printed). For this book, Bruce and Rob wanted a new cut of Electra, since the digital versions available weren’t giving them quite what they were looking for. This time, I got my first look at Dwiggins’s original drawings (actually photographs of the drawings). Instead of an inktrap, the crotches of the capitals are rounded off and softened. The drawings were careful and precise and revealed a design full of eccentricities that were clearly deliberate. 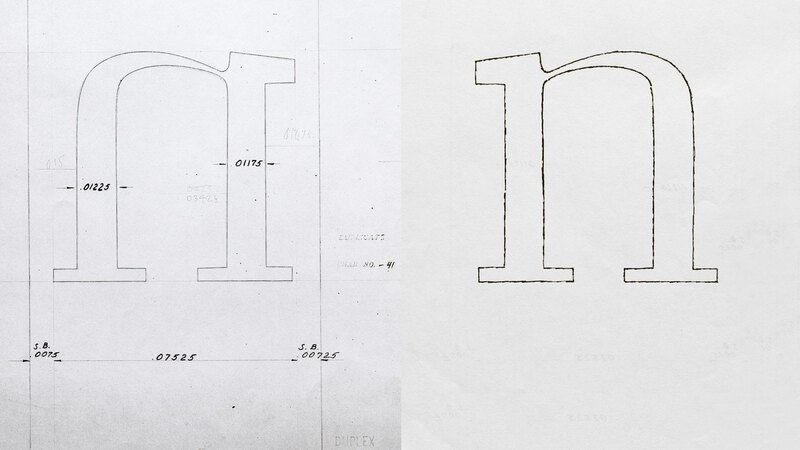 Some serifs have round endings, but most of the serifs were drawn with square endings. 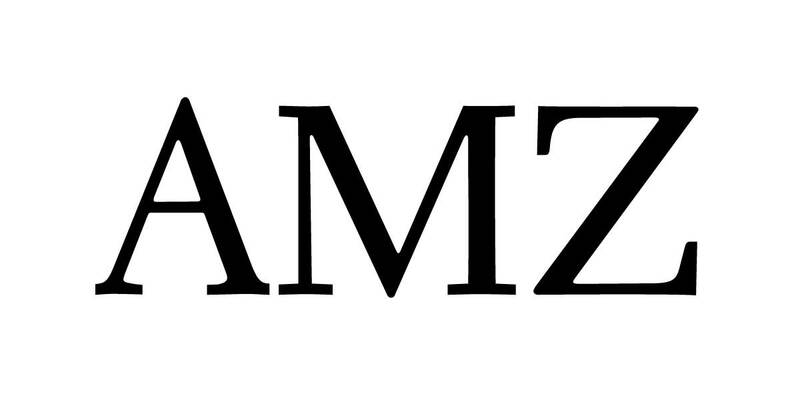 Some serifs were thicker than most – again deliberate. Some corners were bracketed. Some were not. Every once in a while, it seems a letter wants a little freedom and a character is graced with an unexpected curvy stroke. And the crotches (inside angles) of the caps like A, M, N, V, W, X, Y, and Z are not sharp. They are not opened up à la an inktrap. They are rounded off (very carefully with a 9H pencil) which, together with a bunch of similar moves, gives the design a sensitive, soft, handmade feeling. Comparing the original Linotype Electra release booklet printed by letterpress with Jim Parkinson’s new Aluminia. Anything you can add about what’s new about this digitization compared to previous attempts. Something in particular you were trying to capture? The Electra references available to me were either very precise pencil drawings or metal type printed on rag paper. For the book, the weight we were aiming for was the weight of the letterpress samples. The letterpress samples when enlarged lost all detail. It was impossible to conjure the true letter details from these samples. The way the ink squeezed out from the pressure of the printing usually left letters that, when magnified looked like little groups of fuzzy black clouds belching out of some factory chimney. 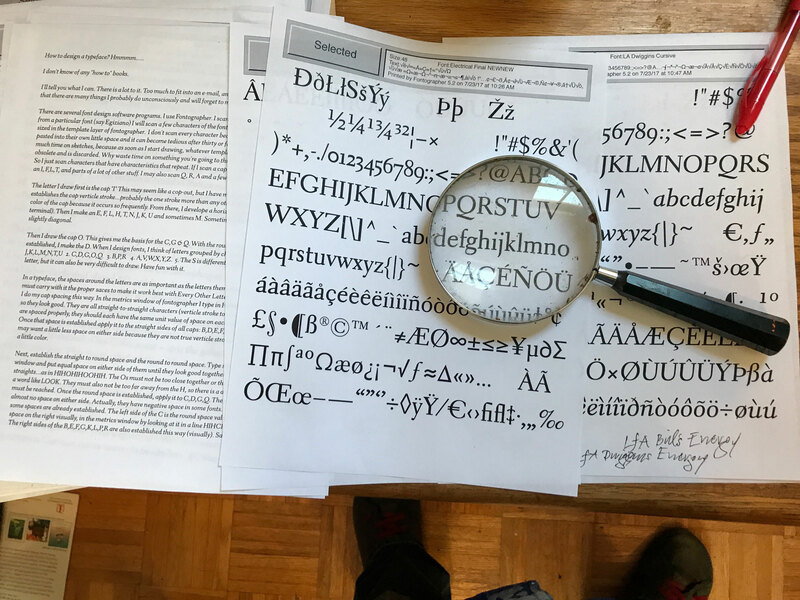 So we made a font from the Dwiggins drawings, preserving all the details. Then we started doing some crude tests, adding small amounts of weight and making a few test fonts until we had one where the weight felt right. Then I tightened down the screws on the Roman and finished off the four-font family: Roman, Oblique, Cursive, and Small Caps. What is your type design process like these days? What tools do you use? Anything changed for this project? I bodyslam fonts together on Fontographer. It’s the first font design program I learned. It’s perfect for the way I work. When I get a font as far as I can in Fontographer, I export it to FontLab. There, I tidy things up a bit, go through the hinting, and finish it off. And, I draw with a mouse. I don’t use a pencil anymore (except for drawings and paintings). This software will keep me happy for the rest of my life. I’d rather spend my time drawing. I know if I wanted to spend it learning new software, that option is available. Is this the first time you’ve designed a typeface for a specific book? How is that process different than for newspaper or magazine projects? This is the first time for a specific book. I have done a number of fonts for magazines and newspapers and they all have one thing in common. At the start, nobody knows where they are going to wind up. They just evolve. With this project the goal was clear, in the distance. A big target to aim at. We thought you might enjoy reading Dwiggins’s full original text from the first specimen of Electra. .... Got in touch with Kobodaishi and had a long talk with him. 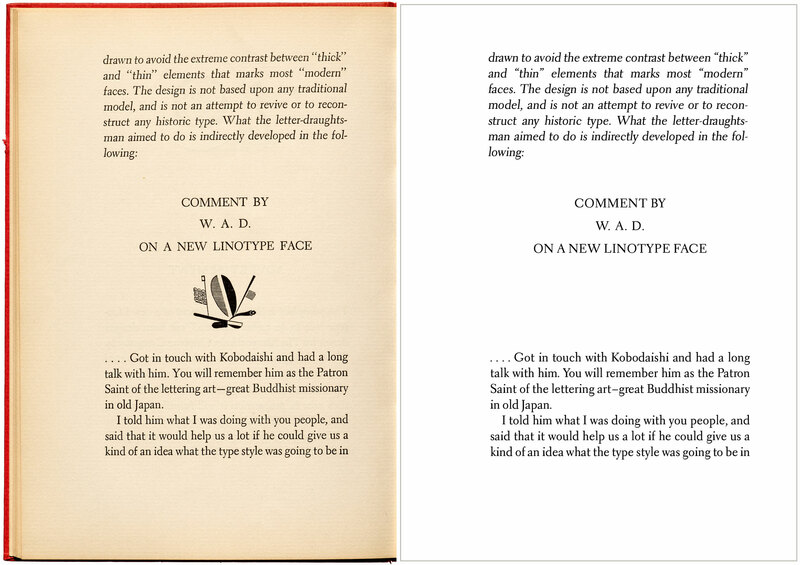 You will remember him as the Patron Saint of the lettering art — great Buddhist missionary in old Japan. I told him what I was doing with you people, and said that it would help us a lot if he could give us a kind of an idea what the type style was going to be in the next ten years — what was to be the fashionable thing, etc., etc. I didn’t say anything for a little while and just let him smoke, and then tried to get him back to giving me an idea of what the trend in type-face fashion was going to be. Of course this pretty much put it up to me, and I didn’t know just what to say. “‘I’ll show you” he went on. “I’ll show you…” and he showed me these letters. “Whose design is that?” I asked. “It’s your design. It’s a design that you are going to make. And it gets pretty close to your idea of what a modern roman type letter is like.” He grinned at me. I had to admit that it was more or less the kind of letter I would make if I weren’t trying to please somebody else — If I were just making letters to please myself. “What’s it called?” I asked. There are a couple of touches that I’d like to point out, though. The weighted top serifs of the straight letters of the lower-case: that is a thing that occurs when you are making formal letters with a pen, writing quickly. And the flat way the curves get away from the straight stems: that is a speed product. Things like that were what Kobodaishi meant, no doubt…. 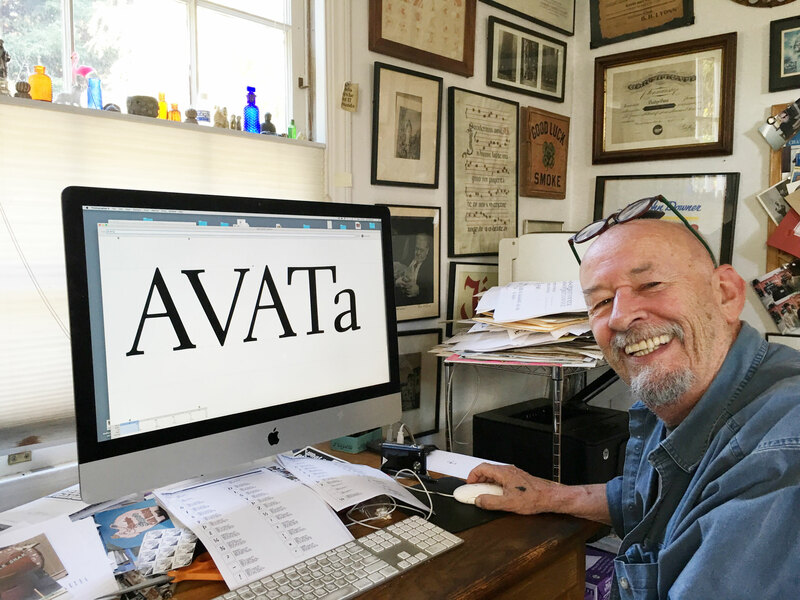 For more about the history of Electra, we strongly recommend Bruce Kennett’s Letterform Lecture from June of this year, where he tells the type’s story, along with scores of great images of the design in development.